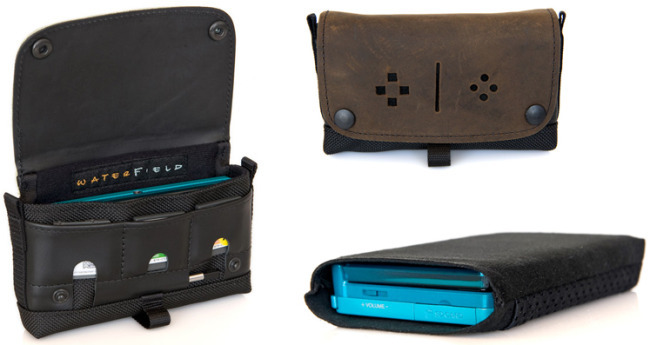 One of my favorite case and bag manufacturer, WaterField Designs, has released a few cases made for the newly released Nintendo 3DS. Like always, WaterField has brought a few familiar cases to the Nintendo 3DS like the Suede Jacket - an ultra-slim and form-fitting suede sleeve with a pocket option, the Nintendo 3DS Case - constructed from ballistic nylon with a double layer leather flap with interior game card pockets, and last but not least the Nintendo 3DS Travel Case - designed to store your Nintendo 3DS with additional accessories including the power brick. Prices range from $11 to $49. The Nintendo 3DS Suede Jacket and Nintendo 3DS Travel Case are now shipping while the Nintendo 3DS Case will start shipping later this month.